Between building a fire, refueling, and cleaning up, your hands take quite a bit of abuse every time you build a fire. 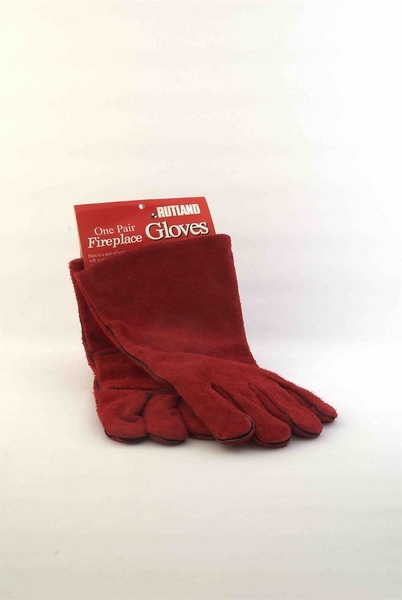 Fortunately, there's an easy way to protect them with these Rutland Red Cotton-Lined Red Leather Fireplace Gloves. Made with real leather and lined with cotton, these fireplace gloves will protect you from the heat as you tend a fire and keep you from getting nasty splinters. Their durability and long gauntlets also makes these gloves ideal for any task where your hands could use some extra insulation and abrasion-resistance. What sizes do these gloves come in and how do I specify my size? These gloves are only available in the standard 12 inch length and are designed to be a one-size-fits-all design. Are these fire place gloves made in the USA? Indeed, these Rutland gloves are manufactured at the company's manufacturing facility in Jacksonville, IL.